The much awaited mobile phone from Samsung called Galaxy S4 is now available in Jarir Bookstore at an amount of SAR 2,699. 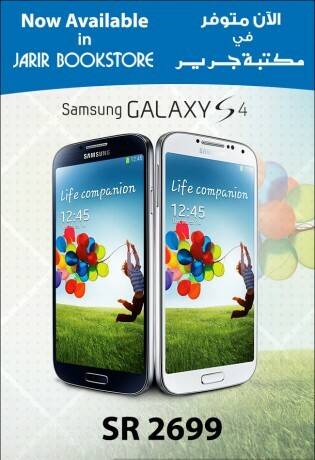 Galaxy s4 is the latest phone by Samsung which is believed to be the best among the Galaxy Series. You may check mashable review here. Here is the specifications of Galaxy S4. Still, above mentioned specification might be superseded again by Galaxy S5 so I suggest to be wise in buying your desired gadget and most of all it should be within your budget. Â soon we will be seeing iPhone 6, so which do you think will be more exciting an S4 or iPhone 6?